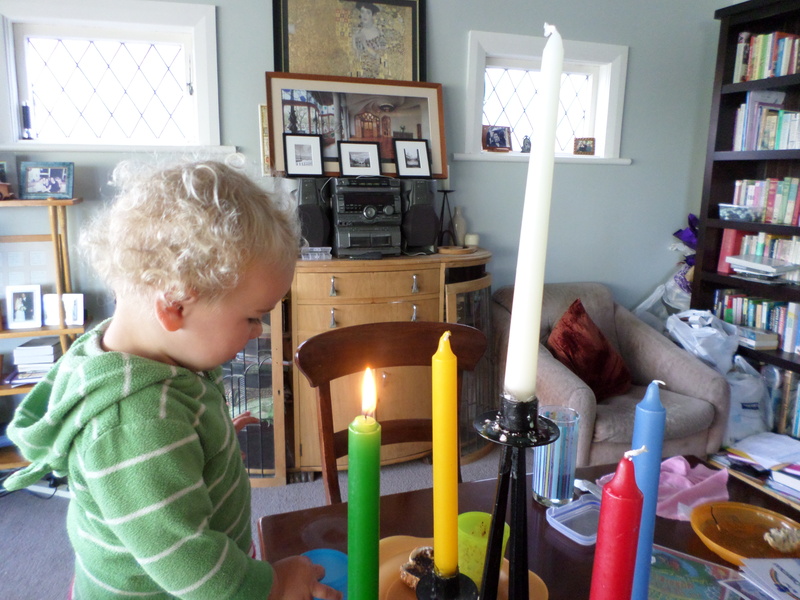 This is an introductory post to our Lent with Kids series, explaining how and why we’re using candles and a bunch of other things to make Lent meaningful at home. I wrote this several years ago now, and it has become a cornerstone of our family spirituality. Skip to the bottom to see the basic six-week plan, with links to more detail. You can also head here, to the series index to see what else is on offer. Welcome! Advent was awesome! What’s next? My toddler adored Advent. Candles! A calendar with little doors to open! Stories! What’s not to love? Of course he only has a glimmer of understanding about what this all means, but can you imagine how that will grow if we do the same thing every year of his childhood? This is the kind of spiritual foundation I really want to build for him. Little kids of whatever age and stage are sponges, learning two or twenty new things every day. Advent gave our family a ready-made structure to become familiar with all sorts of aspects of the Christmas story and the theology of who Jesus is and what he means to us. The repetition each day – candles at night, calendar in the morning – the physical actions and the visual aids consolidated what we were learning. Now, in February, SBJ can still tell you what each colour candle stands for, and what presents the wise men brought to Baby Jesus. We were all pretty sad when it was over. So I got thinking about what else we can do to carry on this intentional formation of our family spirituality. 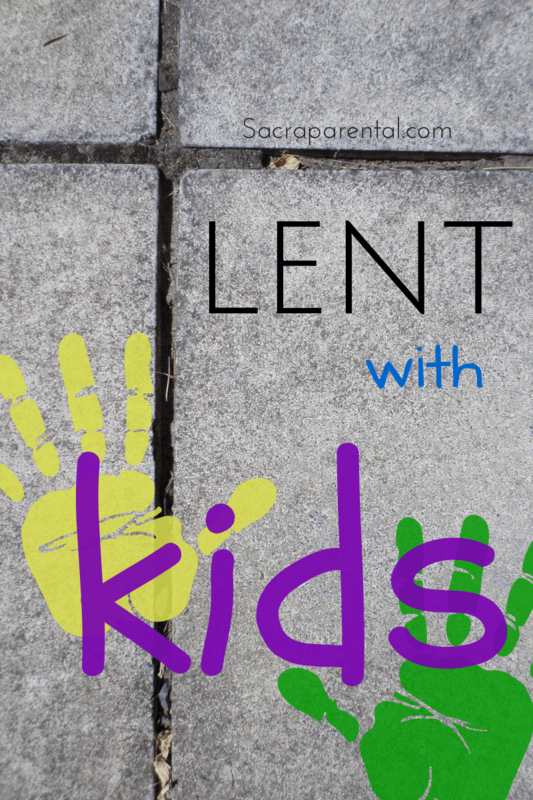 What do kids need in Lent? The next big event in the church calendar is Lent, the six weeks before Easter. What a good length of time for a household-wide focus on Jesus! Traditionally Christians plump for solemnity and sacrifice in Lent, giving up meat, alcohol, or in contemporary Protestant spirituality, things like coffee, television or junk food. I thought hard about that. My son is two years old, and his menu and daily schedule are largely set by his parents. There’s nothing in there that I want to get rid of. I can’t see that any kind of fasting or self-denial would be helpful to his sense of spirituality and connection with God. There are also risks in setting aside a six-week period to do anything if it doesn’t lead to more good stuff in the other 46 weeks of the year. I really enjoyed doing 40 Acts of Generosity last year with Stewardship UK, because it was about kickstarting actions and practices that would continue after Lent. Fasting during Lent is traditionally about focusing, in a particularly strong way, on Jesus. If fasting itself isn’t what I want to do with my toddler, how else can we start a practice of focusing strongly on Jesus during Lent? A physical ritual at dinnertime was brilliant through Advent. Repetition was helpful too. We lit the same candle every night for a week, and said what it reminded us of, then added another in each Sunday. Connecting the ritual of lighting a candle to a simple phrase that made theology real for a little one worked much better than I had expected. We were making it up as we went along, just trying to explain the concepts as they came up, but it came together pretty well and turned into a mini-catechism. We had more trouble with our plan of nightly Old Testament Bible stories (a bit like doing a Jesse Tree), mostly because I kept wanting to censor or skip them. God floods the world? David kills Goliath? I’ll write more another day about how the Bible is R18! With the help of Sister Joan Chittister’s wonderful book on the church calendar and building on what worked for us during Advent, I’ve come up with a plan for Lent with kids, and I hope some of you might join me. It’s designed to stand alone or go alongside any other things you want to do, like fast, go screen-free, or practise hospitality or generosity in a different way. A set of seven candles will anchor the whole period. It’s seven, in order to have a new candle for each of the six Sundays of Lent and one last one for Easter Sunday. Do what you like with colour-coding them. I have a few ideas I’m still tossing up and perhaps we can talk more about that in the comments below. I wondered about using the seven colours of the rainbow, just because it’s the right number, but I think I’d like a white candle for Easter Sunday like the Christmas Day Christ candle on the Advent wreath. Traditionally, the candles in churches are violet during Lent, so perhaps that’s what I’ll settle on: six purple and one white. Each week there will be a matching Bible story, candle, short sentence to repeat, and one-sentence prayer. You can pick and choose what works for you and adapt things however you like. The full list is at the bottom of this post for easy reference. Arrange seven candles for your dining table (or wherever). Stick them to a plate, put them in a candelabra, make a wreath, whatever you like. Each Sunday, read a Bible story together based on the Lectionary cycle (I’ll provide it each week, ahead of time). I’m writing a short sentence to sum up a message from each reading that kids can repeat when lighting candles. Feel free to adapt it for your family, of course. Each Sunday, light a new candle, just like in Advent. Start with just one, then add the next one each Sunday, then the next, and so on. Each night (or day) that week, light the candles you’ve done so far and repeat the short sentences that matches the stories and the candles you’ve done so far. Whenever you pray with your household (bedtime, mealtime, whatever), use the one-sentence prayer that matches that week’s candle and reading. I think we might light the candles at the start of dinner and pray together at the end, and see how that goes. I reckon this will work for kids of all ages and stages, but I’m keen for your feedback on that. There’s still plenty of time to change the plan to incorporate your ideas and wisdom! For pre-verbal littlies, if all you do is light candles together, with an adult saying the sentence, that will be a lovely practice to mark Lent as a special time and build on for next year. Children of all ages can engage with Bible stories in an age-appropriate version. I’ll provide some options, week by week, particularly for Easter. You might decide your kids are too young to have Jesus’ betrayal and death in the story this year, for instance, especially if there’s a two-day wait for the happy ending. I think that’s absolutely fine. For older kids, you might want to add another element in that puts what we’re thinking about into action. Is there a something practical you could do together to connect with the weekly themes? One week is about Jesus giving us a job to do, for instance. That week, could you all pray together to hear from God what job has your name on it? Maybe you could brainstorm ways you can make the world better this week, and tell stories each dinner time of the kind things you did during the day. I’ll provide some resources each week for this stuff, too. If your kids are keen on art or music or sport, is there a way to connect those things in? Maybe they could draw pictures of the Bible stories, or learn new songs on the theme or practise hospitality by inviting someone new or left out to kick a ball around. I think if we put our heads together we’ll come up with all sorts of great things to do. Find seven candles and arrange them however you like. Have a household chat about Lent and what you’re going to do together. Talk to other people you know who might be interested and share these posts to get them fired up. Join in the conversation here about how to adapt the pattern for your household, and add your ideas into the mix. Let us know what works for you guys! Give us your ideas and what you’re learning. So what do you think? Does this sound helpful? Do you think your kids will be into it? What have you done during Lent before now? What else could we do or how could we adapt things to make the most of the opportunity? I’m very keen on your collaboration with this! You might also want to show this to the leadership at your church, if you are part of one. This could be a great activity to do together, across the church, if you don’t already have beyond-Sunday plans for Lent. Start with a pancake party on Shrove Tuesday. Adults or older kids might also like to attend an ashing service on Ash Wednesday. From Wednesday to Saturday, once a day, whenever it suits your household, light the first of your seven candles. Read: Jesus facing temptation in the desert, Luke 4, or another suitable text. Practise: Making wise choices through the week. Discuss: How did we try to be wise today? Pray (shorter): Thank you Jesus, for showing us how to be wise. Please help us make wise choices. Pray (longer): Thank you, God, for sending Jesus to show us what you are like. Thank you that we can get to know you and learn how to live wisely because of Jesus. Please help us to make wise choices through the power of your Holy Spirit. For art, craft, movies, games and more, go to the full post for Week 1 of Lent. This week, once a day, starting on the first Sunday of Lent, light two candles. As you light the first, say the first week’s sentence: ‘The first Lent candle reminds us that Jesus is wise.’ Then light the second candle and say this week’s sentence. Read: Jesus’ transfiguration (Matthew 17, Mark 9, Luke 9), or another suitable text. Practise: Being brave through the week. Discuss: How did we try to be brave today? See the full post for Week 2 for more discussion ideas. Pray (shorter): Please Jesus, help me make brave choices. Pray (longer): Thank you, Jesus, for bravely coming to show us what God is like. Please remind us this week that we can choose to be brave, through the strength of your Holy Spirit. For art, craft, movies, games and more, go to the full post for Week 2 of Lent. This week, once a day, light three candles. As you light each one, say the sentence for that candle. Read: Jesus and the woman at the well (John 4); or the Good Samaritan (Luke 10), or another suitable text. Discuss: What did we do for today? See the full post for Week 3 for more discussion ideas. Pray (shorter): Thank you, Jesus for giving me important jobs to make the world better. Pray (longer): Thank you, Jesus, for letting us join your team to make the world better. Please show us what jobs you’d like us to do and help us to do them. For art, craft, movies, games and more, go to the full post for Week 3 of Lent. Christ and the Woman of Samaria 1828 George Richmond 1809-1896, at the Tate. This week, once a day, light four candles. As you light each one, say the sentence for that candle. Discuss: What did we do for today? See the full post for Week 4 for more discussion ideas. Pray (shorter): Thank you, Jesus, for giving us a fresh start whenever we need one. Pray (longer): Please help us to understand that you forgive us. Please help us to follow your example and forgive other people too. For art, craft, movies, games and more, go to the full post for Week 4 of Lent. This week, once a day, light five candles. As you light each one, say the sentence for that candle. Read: Jesus raises Lazarus from the dead (John 11:1-45, or until verse 53). Discuss: Who do we think Jesus is? See the full post for Week 5 for more discussion ideas. Pray (shorter): Thank you, Jesus, for being in charge of life (and death). Pray (longer): Thank you, God, for sending Jesus to show us how to live, and letting him be in charge of life and death. Help me to trust Jesus with my life. For art, craft, movies, games and more, go to the full post for Week 5 of Lent. Jesus raises Lazarus to life – John 11:1-44; JESUS MAFA: Jesus raises Lazarus to life, from Art in the Christian Tradition, a project of the Vanderbilt Divinity Library, Nashville, TN. This is a painting of how a community in Cameroon acted out the story. This week, from Sunday to Thursday, light six candles. As you light each one, say the sentence for that candle. Light all six candles each day this week, but on Good Friday, you could light them and immediately snuff them all out. Don’t light them on Saturday. On Easter Sunday, light all six and then the seventh, final, Christ Candle. Discuss: Who do we think Jesus is? See the full post for Week 6 for more discussion ideas. Pray (longer): Please show us what kind of King you are, and help us to get to know you better. For art, craft, movies, games and more, go to the full post for Week 6 of Lent. You can join the conversation in the comments below or on our Facebook page. Let’s talk! Sounds great Thalia. Kids love candle lighting and advent is the obvious season but to have a special sequence for Lent is a really good idea. Perhaps we can have a chat sometime about including the kids at St Marks Network. Yes, great! I think visual art is another thing to explore here – so much sacred art on the lectionary texts – and St Marks folks would get right into that, too, probs. Thanks – for your wonderful ideas! So helpful. Have you used The Jesus Storybook Bible? It’s my favourite children’s bible although it’s a bit wordy for the little ones. Hi Christina, thanks for your kind words! I’ll be keen to hear what you end up doing. Yes, The JSB is def my favourite, but I have been finding that most of the Old Testament is still too, well, negative for a littlie! He loves the New T stories, though – I thought there would be way too many words to pictures for a while yet but there’s plenty to look at, it turns out. Pingback: The Huge List of Free Resources for Lent and Easter for Kids - Future.Flying.Saucers. You might want to add two Godly Play stories into the mix: “The Mystery of Easter” and the “Faces of Easter”. Source: The Complete Guide to Godly Play by Jerome Berryman volume 4. Godly Play adds a WONDER dimension to help children explore the great mystery of Lent and Easter. These stories could be the ‘devotion’ part of each week leading up to and including Easter. Hi Thalia, I’ll be sharing this with my church community this week. Thanks again! I just came across this and love it. I grew up doing something similar but we lit all the candles on the first week and each Sunday we put one out to symbolize the light going out of the world (whereas in advent you light one each week to remind you of the light coming into the world). The last candle is extinguished on Good Friday and they are all lit again on Easter Sunday. Excited to do this this year!